In our house we have the tradition of making a Mexican fare dinner every Monday night. Cooking up a homemade meal at the start of the work week with Gatsby as my sous chef always de-stresses me. I love Mexican cuisine because even the simplest of recipes tastes delicious and flavorful. If I’m in a time crunch I might just whip up some ground turkey or grass-fed sirloin tacos stovetop with a toppings bar, or if I’m feeling adventurous I’ll cook one of my classic recipes with a healthy spin. Here is one of my favorites. 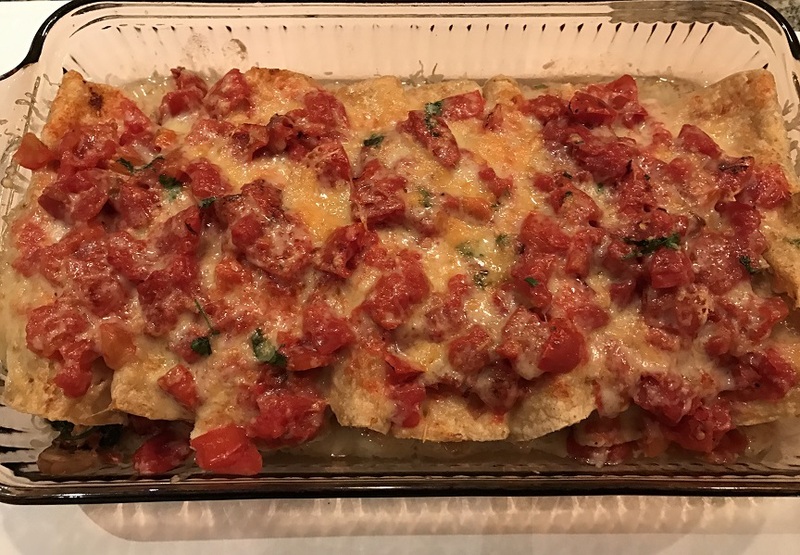 Place 4 boneless skinless chicken breast halves at the bottom of the crockpot topped with two cans of fire roasted tomatoes. Cook on high for 3 hours. Preheat oven to 250 degrees. Wrap tortillas in tin foil and place in the oven to warm. In a large sauté pan heat the olive oil and sauté garlic, mushrooms and onion with Mexican seasoning and cinnamon. When onions begin to brown add spinach. 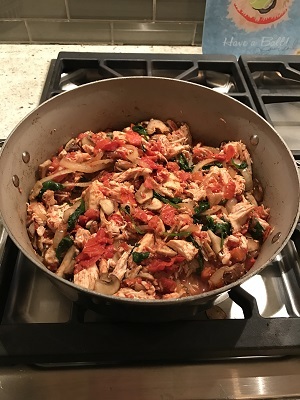 Shred the chicken using two forks or your fingers leaving ½ the tomato sauce in the crockpot to use as a topping. Add the chicken and tomato mix to the vegetables. Sprinkle with cilantro and lime juice. Remove the tortillas from the oven and set the broiler. Divide the chicken and vegetable mixture equally into the warm tortillas and roll each one up. Line a greased casserole or baking dish with the rolled enchiladas, seam sides down. Pour the reserved sauce over the chicken enchiladas and top with the cheese. Place the enchiladas in the oven 6 inches from the broiler and broil for 5 minutes, until the cheese is melted. Be careful not to burn. You can also make this with a store bought rotisserie chicken to save time. Just add in the canned tomatoes once the vegetables have cooked (Step 3). Cook for another 10 minutes, until the flavors are well-married and the sauce is slightly thickened. Stir in the cilantro and lime juice. Reserve half of the sauce in a separate bowl to use to top the enchiladas. Add the shredded chicken to the sauce that still remains in the saucepot and heat the chicken through.